The most complex and well-known of the three different volcano types, the stratovolcano or composite cone volcano, often goes centuries between eruptions. Composite volcanoes take hundreds of years to build up their steep sides through periods of eruptions and sleep. 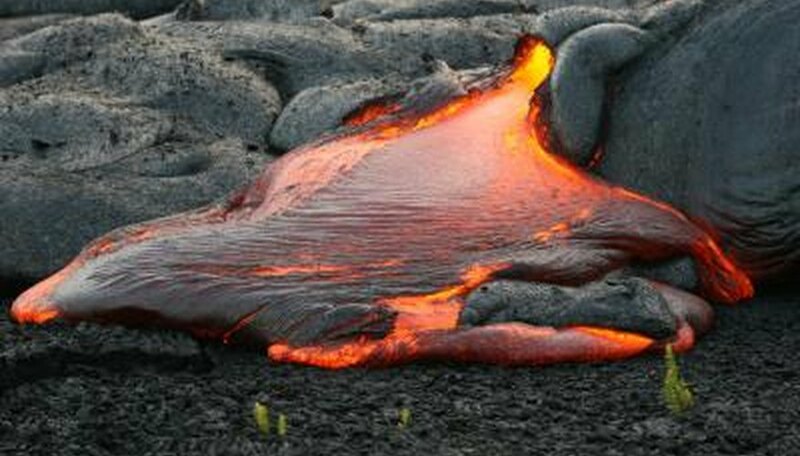 Volcanoes first form when a vent in the Earth's crust reaches down into pockets of molten rock called magma. Magma escapes from the vent and builds up a mound around it as it cools and hardens. In stratovolcanoes, this mound typically grows to be a giant mountain as is seen in Mt. Fuji, in Japan. Fuji stands 12,388 feet above the plain and has erupted at least 16 times since 781 A.D.
Stratovolcanoes, composite cone volcanoes, represent more than 60 percent of the volcanoes present on the Earth today including Mount St. Helens in Washington and Mount Vesuvius in Italy. Typically filled with a more viscous lava, consisting of andecite and dacite, composite volcanoes are made up of about half lava and half pyroclastic material, a type of sedimentary rock formed from pieces of other broken rocks brought up from deep within the Earth. Stratovolcanoes are called composite volcanoes because they made from a series of eruptions that have occurred over thousands of years. The eruptions that form these volcanoes lay down alternating layers of lava, ash, cinders and pyroclastic material. While this type of volcano might have only one vent, it also might be a composite of several vents. Composite volcanoes have steep slopes, forming a basically symmetrical shape. The last eruption of the volcano may have even created a bowl, a caldera, at its peak, making it appear as if the top of the mountain was sliced off, or it may have collapsed from its own weight. Before Mount St. Helens erupted in 1980, it had a pointed top. In recent pictures of it, it now has a bowl shape where it's peak once stood. Composite volcanoes vary in size, based upon how long they have been active, how many eruptions they've undergone and how much they've eroded with time. 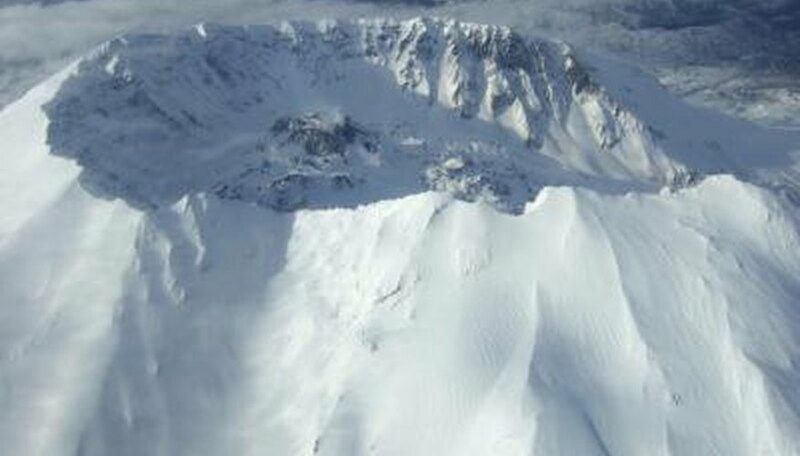 Mount Shasta, in the Cascade mountain range in Northern California, for example, stands 14,163 feet above sea level, while Mount Vesuvius is only 4,203 feet and Krakatoa sits only 2,667 feet above sea level. The base of a composite volcano can grow as large as five miles across. Composite volcanoes grow through their eruptions. One type -- Plinian eruptions -- include a large, chimney type plume that can climb 27 miles, or 45 meters, into the stratosphere. 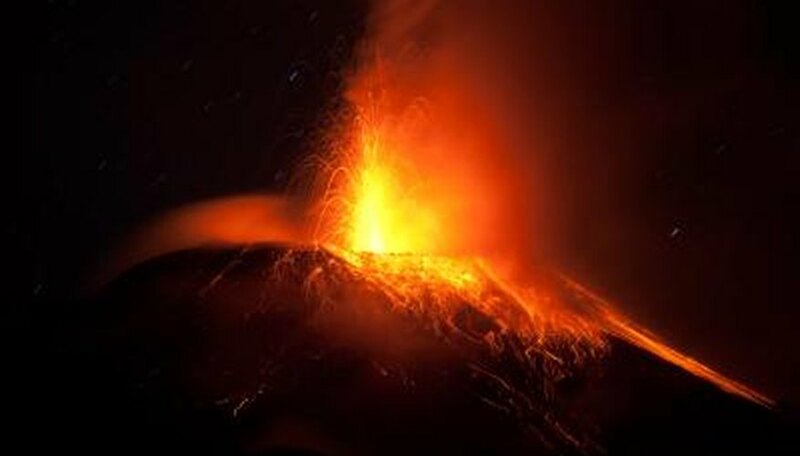 These explosive eruptions are named after Pliny the Younger, a Roman statesman known for his accurate, telling and objective description of the explosion of Mount Vesuvius in 79 A.D. Along with these eruptions, composite volcanoes get formed by their pyroclastic flows, a type of eruption that ejects rocks, ash, gases and lava from the volcano at high speeds, in some cases, as high as 100 miles per hour. The volcano starts out as a slash or vent in the ground, and through eruption, heaps up lava, ash, cinder and clastic rocks to build its witch's hat shape. When composite volcanoes go dormant and stop erupting, they are sometimes worn away by erosion until there is almost nothing left of them. They are also destroyed when further eruptions blast apart the volcano cone. The depressions that are left after erosion and explosions are known as calderas. A good example of a dormant, eroded composite volcano is Mount Mazama in the southern Cascade mountain range in Oregon. The volcano collapsed, forming the caldera now known as Crater Lake. Most composite volcanoes form in subduction zones where the boundary of one tectonic plate goes under another plate. Tectonic plates represent pieces of the Earth's crust that touch and move, resulting in earthquakes and volcano formations along these borders. Many of the world's most active composite volcanoes sit atop the Pacific Rim -- the Ring of Fire -- a chain where these tectonic planes connect along the continental coasts of Asia, North America, South America, Australia, New Zealand and Antarctica. 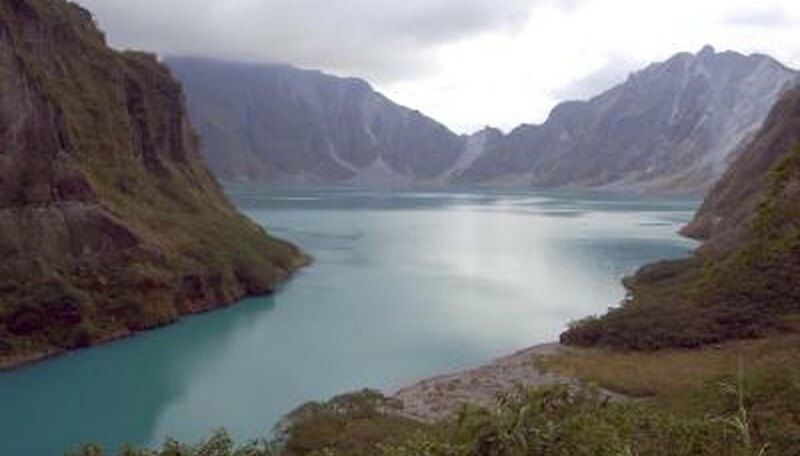 Mount Mayan, on the island of Luzon in the Philippines, began erupting in January of 2018, with a plume that created a mushroom-type cloud and deposited ash and lava, while across the Pacific Ocean, in Washington, Mount St. Helens started waking up that same month, as noted by scientists keeping track of the earthquakes and tremors that signal magma activity. Some volcanoes don't look like volcanoes at all. The shield volcano, the type found in Hawaii, don't usually have violet eruptions, unless water combines with lava near a vent. These types of volcanoes typically eject lava in a slow-moving way, like thick water flowing out of a fountain, instead of plumes and pyroclastic flows. Supervolcanoes, like the one in Yellowstone National Park, look more like big open valleys or bowls, having a caldera shape, but they remain active with hot-water springs, fumeroles -- openings where stinky gases emit -- and shooting geysers. Thompson, Jason. "Composite Volcano Facts for Kids." Sciencing, https://sciencing.com/composite-volcano-kids-8520190.html. 20 April 2018.